Animal Reiki is a wonderful gift to offer your animal to show your appreciation for the unconditional love, comfort and joy they bring to your life. For healthy animals, Reiki helps to maintain their health, enhances relaxation and provides an emotional sense of peace and contentment. 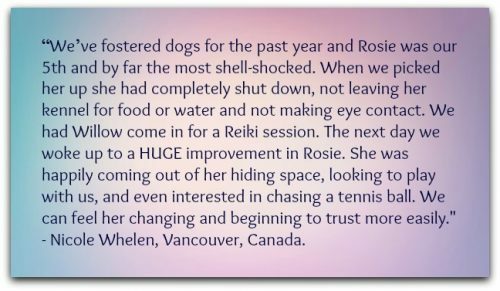 For animals who are physically ill or experiencing behaviour problems, Reiki is a peaceful, non-invasive healing technique as well as a safe, complementary therapy to conventional veterinary medicine. Reiki is an energy therapy that allows your animal to enter a deeply relaxed, meditative state that ignites their bodies own innate healing abilities. If your pet is experiencing pain, anxiety, stress or fear, Reiki has the ability to heal on all levels, mind, body and soul. Reiki, widely used as a complimentary modality for humans, is gaining popularity in the animal world as well. It is an ideal therapy for pets because it is non-invasive, gentle, painless, stress-free and does not require direct physical contact to be effective. Animals are particularly sensitive and open to Reiki and can quickly identify the energy the practitioner is offering. 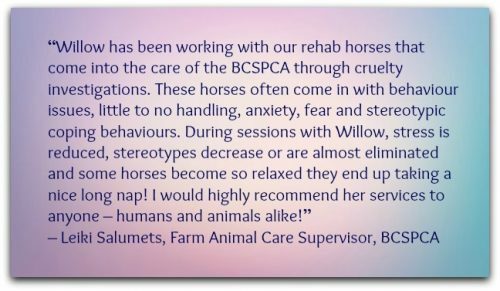 Typically they will approach as a willing participant and take charge of their own treatment. During a healing session the animal will accept Reiki in the ways that are most comfortable for them, either hands-on or from a distance or a combination of the two. Reiki is never forced on an animal. In a healthy animal, energy will flow through the body much like an electric current. Any blockages of this energy can manifest into physical, psychological or behavioral problems. A practitioner providing Animal Reiki restores positive energy flow into the body, correcting imbalances and supporting healing on all levels. Please Note: The contents of this website are not intended as a subsitute for professional veterinary care. Reiki sessions are given for the purpose of stress reduction and relaxation to promote healing. Reiki energy therapy is not a substitute for medical diagnosis and treatment. Reiki practitioners do not diagnose conditions nor do they prescribe, perform medical treatment, nor interfere with the treatment of a licensed medical professional. It is recommended that animals be taken to a licensed veterinarian for any ailment they have.